Smart City Week: Major Players – Jarman International K.K. Nissan took a large section of the exhibition floor with a very bold display of their latest in electric and smart car technology. Complete with a small track to test out their new model of smart car, Nissan demonstrated well and with style the future of vehicles in our urban landscape. Attendees lined up and made reservations to experience first hand Nissan’s compact and economical “Choi-Mobi”, or literally “Small Mobile”. This car, which achieves comfortable speeds for city cruising, will actually be available as part of a car-sharing network in Yokohama. The car of course is not Freeway worthy, but for the expansive city landscape of Yokohama, this is the perfect solution for a day trip for two, or business visits. Additionally on display was the more heavy hitting consumer vehicle, the Nissan Leaf. As part of a dynamic “Leaf to Home” system coined by Nissan, the Nissan leaf provides a comprehensive private solution for an electric vehicle that is managed by home electricity consumption. 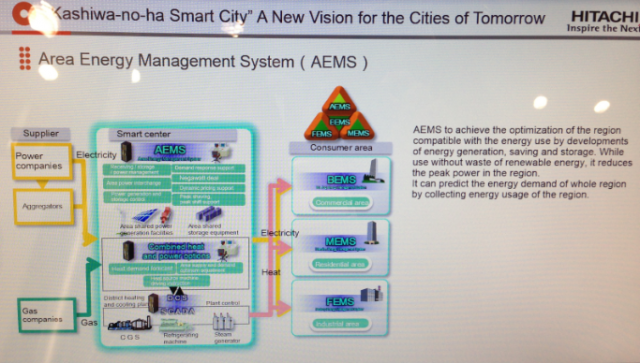 The approach to energy management functions essentially on a smart grid system, so managing all of ones appliances, now including the vehicle, through smart electricity management is one of the crucial points of Smart City. Hitachi was another large company to keep an eye on at the event. City solutions from every major angle were outlined, and plans to implement them in different areas of Japan were already underway. Energy, transportation, healthcare, and water were the primary macro city elements that are being addressed in communities in Japan such as Yokohama city in Kanagawa, and Kashiwa city in Chiba. Furthermore, similar implementations being made in Maui, Hawaii were also showcased. Water and energy solutions are perhaps the most crucial aspects in need of improvement for developing nations. As new systems are implemented in developed nations, bonds can be formed between local municipalities and corporations to solve water and energy solutions immediately in developing countries. this is the vision of course, and hopefully we will see action in the near future. Large corporations develop solutions in unison, to better provide industry and job creation to municipalities and developing nations. Nissan’s automotive solutions along with the energy, traffic, and water management systems of Hitachi are two of the key building blocks in finally not feeling like our time as urbanites is running short.